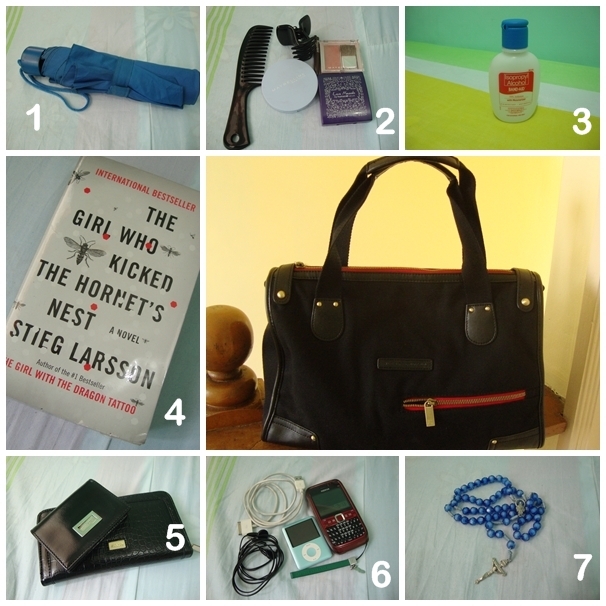 Home » life » What's inside my bag? It's been a week since I last updated my blog. Pardon my silence because some free lance jobs kept coming last week. I have some small research jobs to finish within the week. Most of these jobs are still in the preliminary phase, so no earnings yet for me. Setting aside the modest monetary earnings, what I love about my free lance jobs are the opportunities it give me. I am able to exercise my research skills, which I have not been doing in my current position. I am able to help colleagues, friends, strangers turned clients to friends finish their masteral studies and more importantly a completed job makes me feel so accomplished. It gives me self worth, which I seldom experience these days. If I would blog about my free lance research jobs, you will surely get bored. ;-) You wouldn't want to see theories, numbers, tables, figures and all those academic things. I've been so eager to blog but I can't think of a topic to write. :-( To break my long silence, allow me to share a little something about myself. Presenting, what's inside my bag..
First and foremost, the excessive things in my bag are explained by the fact that I am a regular commuter. I transfer to three different transportation on the way to work. (jeepney-train-jeepney) My average travel time from home to work is 1.5 hours, under normal conditions. This means no traffic and no technical problems in the mass rail transit. 2.Beauty Kit - comprised of a comb with large teeth (for my long, tangled and unmanageable hair), hair clamp (to tame and hide the unruly hair), face powder (preferably Maybeline's Clear Smooth Extra), eye shadow (Human Nature's Mineral eye shadow), blush (preferably Maybeline's Cinnamon Rose), and dark brown eye brow pencil. 3. Alcohol - Another must for every commuter! I prefer those brands with moisturizer to prevent having dry skin. 4. Book - To drive away boredom and to keep me awake every morning on the way to work. 5. Wallet - of course! Small wallet for my coins and big wallet for the cards etc. etc. 6. Techie stuff - My almost defunct Nokia E63 and my iPod Nano. My iPod Nano keeps me away from boredom on the way home. I usually go home so late so reading books is no longer possible. In that case, my iPod Nano is there to save the day. 7. Rosary - To remind me of my devotion to the Blessed Mother. During times of distress and trials, this has been my constant companion and refuge. As I am writing this post, I still have tons of paper to check. It's 6:08 pm and in a few more hours it will be Monday, a start of another work week. Things have not been good at the work place over the past days but as always, life should go on. This too shall pass. oh my goodness...if this is all that you have in your bag...it may be full, but very neat! :) I have all kinds of crazy things - bits of cereal, wrappers, raisins, trash, Toy Story figures, etc. It is not a glamorous bag for sure! I'll blame it on the kids. :) Have a happy week my friend! Oh yes, an iPod is every commuter's best friend. when i used to ride the bus before, naka-iPod din ako, sabay shades para makatulog. Hahaha. Errr... nahiya ako ipakita laman ng bag ko. Parang ang dami ko tuloy basura, haha.